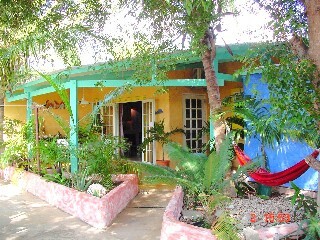 Imagine your own Caribbean style bungalow nestled in a mature tropical garden. While away your siesta time in your own swaying hammock. Dive at over 20 sites within a 3-5 mile radius. Windsurfing is less than 4 miles away. Coco Palm Garden is a casual property south of the airport. Rooms are under 100 USD a night in most cases. Book now and stay 7 pay for 6 until November. Call 508 737 5245 or on island 011 599 786 3134. This entry was posted on May 3, 2011 at 10:50 am and is filed under Where to Stay. You can follow any responses to this entry through the RSS 2.0 feed. You can leave a response, or trackback from your own site.